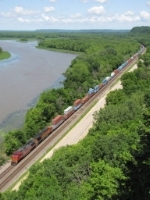 Description: BNSF Eastbound Intermodal Train at Hardin, Mo. Description: A Croxton Yard third trick job finishing up at the NYS&W interchange. 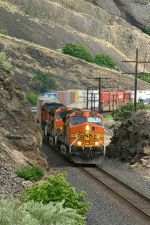 Description: looks weird to see DPUs on intermodals especially on the Transcon in Missouri...guess I'm too "old school".. Description: We just barely managed to catch this train. 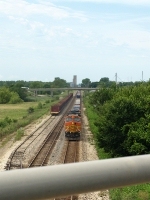 Rail train in the siding. Description: 3 locos vs my car, wouldn't be pretty! Description: Obviously the catch of the year (thus far) on the Peoria sub.